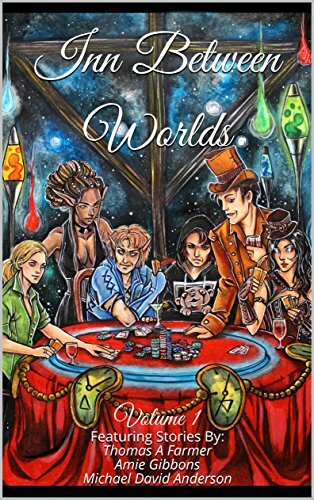 An anthology of linked science fiction and fantasy stories by several excellent authors, including Amie Gibbons. Her part is called “Chaos Candy“. Sitting outside of time and space is the Inn Between Worlds. Residents might say it’s a place for travelers, or a place to rest, a place to find excitement. Or they might say it’s dangerous and to be avoided at all costs because Reality Does Not Work Right inside its infinite walls. The three stories share one important point: their events would not have been possible without The Inn. “Gideon Wallace and the Sapphire Woman” is the first story in a new series by Thomas A Farmer, and shows what happens when a mortal man finds himself drawn into a fight between gods. In “Chaos Candy,” by Amie Gibbons, supernatural bounty hunter Zee tries to uncover a dark secret and learns much more than she ever wanted to know. Finally, Michael David Anderson’s “Flux” continues the adventures of Teddy Dormer, taking him once again to strange new places and showing him new nightmares. This entry was posted in book and tagged Amie Gibbons, writer. Bookmark the permalink.